What Is House Wrap and Why Is It Used? The next step for the exterior of the house is an energy efficient house wrap of the outer sheathing. It is a breathable surface that prevents water from being trapped between the OSB walls and the siding, preventing mold, warping and other water induced problems for the outer structure. The wrap goes up over the course of a day by a small team with an army of ladders. The house wrap is attached with small nails and staples. As you can see from the pictures, Ryland Homes must have a bulk purchase deal with Green-Guard, as their logo is emblazoned over every piece. Contractors use house wrap to cover the wood frame before the application of stone, wood, brick, or vinyl siding. House wrap helps keep moisture away from the interior of the house and protects the surface of the exterior walls. House wrap is made with water-resistant materials such as polymers, nylon, or fiberglass, but it can also be made of polyethylene. It is usually a yellow or white paper-like sheet that has a glossy sheen. It comes in wide rolls with a width measuring up to 9 feet. As the name suggests, a house wrap functions more like gift-wrap protecting and sealing the item inside by covering all edges and functioning as a boxing cover around the house. 1. Virtually all houses have wood in their structure, moisture during the framing of the house is a dilemma you will face from time to time especially if you don't water-proof your house. When moisture seeps into it, it could rot, encourage mold growth, and cause health hazards to the occupants. House wrap can help prevent these things by protecting the structure and surface of your house from moisture damage. The plastic membrane of the house wrap acts as a barrier and prevents water seepage. As it keeps the structure dry inside, you will not have to worry about these problems. 2. Aside from shielding the house' structure from damaging buildup of moisture, a house wrap also serves as a good insulating material. The plastic-like, non-airtight feature of a house wrap limits air flow and reduces heat exchange from the interior and exterior of your home. This insulating effect, in turn, helps ease the burden on the part of your home conditioning system, helps you save energy, and lower your utility bills. 3. Not only does house wrap serve as a multi-purpose weather barrier, it also acts as a drainage plane. House wrap blocks water from passing through the structure but lets water vapor seep inside. This, then, allows moist humid air to break out from the inside while keeping liquid water off the interior of the home. Instead, it directs the rain water away from the house structure and straight to the ground. Aside from these three main functions, another benefit of using house wrap is in terms of its durability. Although made of a thin sheet, house wrap can withstand normal wear and tear. If installed properly, it could last for a long time without showing signs of deterioration. However, according to Federal Emergency Management Administration or FEMA, compared to building paper, the latter can endure extreme hot or extreme cold climates and high winds better. Therefore, house wrap may not work well on places with these kinds of climate conditions. 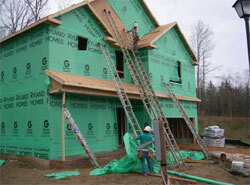 Overall, house wrap is a great investment you should consider when constructing a new home. Though it has a number of advantages, installing it the wrong way can prove very hazardous rather than useful. FEMA has instructed that the sheets should be installed in horizontal rows with its top and bottom overlapping and seams covered with protective tape. There are specialists who can do the job for you if you believe you are not up for the challenge. Proper installation is the key to making your house wrap work for you. If you are unsure how to go about installing house wrap, check with your local hardware store for some advice. Contractors in your area may also be able to come out to see the job and offer their expertise.